Fishing from a kayak in Georgia is great! Have you ever been crappie fishing back in a cove full of button bushes and thought “if I could just get in behind these bushes I could load the boat with slabs?” Ever crossed a rocky river and thought about all the bass in the deeper holes and wished you could get to them? There is a way. Kayak fishing is becoming more and more popular as people learn about it. Fishing from a kayak is inexpensive, it allows you to get to places others can’t fish and is a peaceful way to cover waters you can’t reach from the bank. And some modern kayaks are stable enough to stand in while casting. Randy Vining has fished all his life. He started going to ponds creeks with his grandfather and progressed to the point of having a big bass boat and fishing tournaments. A couple of years ago he discovered kayak fishing and it allowed him to “get back to his roots” of fishing smaller waters, and catching more fish. His bass boat has not been moved from his yard in two years now. Now a board member of the Georgia Kayak Fishing Club and on the Ocean Kayak Pro Staff, Randy gives seminars and has helped organize the first bass tournament trail for kayak fishermen. He has a half-dozen different kayaks and has spent many hours rigging them to make them efficient fishing boats. The growing sport of kayak fishing is a big part of his life and he is enjoying the hours on the water as well as the time spent helping others. Choosing a fishing kayak is not as simple as you might think. What length and width do you want? Does color make a difference? Should you get one like you see on TV in the Olympics with people running white water rapids? Randy says as “sit on top” is much better for fishing than a “sit inside” kayak. Sit one top boats can’t sink because they are full of air. They allow more freedom of movement and you can even stand up in some models. You can carry much more fishing equipment. And if you tip over you can get back in without having to learn the “paddle roll” method of righting the boat. In general terms, width equals stability and maneuverability and length equals speed and straight tracking. If you are fishing the creeks on Lake Blackshear working around the cypress trees fishing for bass, you want a short, stable boat. If you are paddling three miles off-shore to fish for Spanish mackerel you want a fast boat that is easy to paddle and tracks straight. Pay attention to the front and back. A deep skeg on the back is good for tracking in a straight line but not so good for running river shoals. A pointed bow makes the boat cut through the water and move more easily but is less stable for leaning side to side. Color may not seem important but you need to consider two things. You are going to be in direct contact with the boat so you want a color that does not get too hot. And you want a very visible color so other boaters can see you. Randy says a yellow color stays cool and is visible. You can get a good basic fishing kayak for less than $1000 new. You will probably spend that much more rigging it though. You will save money on gas and oil since you don’t need any in the kayak and you don’t have to tow a heavy boat and trailer. Kayaks don’t have to be registered since they don’t have a motor. And you can start with the basics and add the more expensive rigging as you learn what you want to do with your kayak. You can get a kayak and a paddle and go fishing. But there are many accessories that will make it more comfortable and make fishing more efficient. The nice thing about most accessories is they are easily interchangeable with other kayaks and you can take them off or put them on as the situation demands. Accessories clip on the boat or slip into mounting holes you cut for them. The taller you are and the wider your kayak the longer paddle you need. A shorter paddle means you have a higher angle and don’t dig as deep when paddling but a longer paddle is more cumbersome to handle and store. With any length it is important to get a good leash and keep it attached to the boat. You don’t want to be up the creek without a paddle and you can hold on to the leash to help you get back to the boat if you tip over. A good seat with a support for your back is a basic necessity. Your back can get very tired if you paddle and fish very long so try different seats until you find one that gives you good support. Inflatable seats are comfortable but may not provide enough back support. An anchor trolley is a rope and pulley system that runs the length of the boat and helps you move your anchor or drag chain to adjust it. You can also use it to tie up along side a dock. And you can clip it to your belt when you get out to wade and your boat will stay with you. Fishing accessories are as varied as your imagination wants them to be. Dry boxes are good for storing things you want to keep dry, like a cell phone, and the built in boxes in a kayak will not stay completely dry. Tackle boxes can be bought to fit existing compartments or you can make special attachments for them. Coolers are the same. Rod holders, a depthfinder and/or GPS can be mounted where you can use it but it does not get in your way. You can get a rudder system that you control with your feet and some kayaks even have a propulsion system that you paddle with your feet. A drag chain is important for fishing moving water and you can make your own with a piece of chain run into a bicycle tire tube to keep it quiet and make sure it doesn’t hang up as bad. Plan on getting wet when fishing from a kayak. Even if you don’t tip over you will get wet from water dripping from your paddle. In cooler weather you can wear waders to keep you dry and also to use if you get out of the boat to fish. Boating laws require you to have a life jacket and should wear it at all times. Get one that has straps at the top rather than bulky floats to allow freedom of movement while paddling. But be sure to get one that is comfortable to wear all day. You will need one white running light and battery powered ones are available. A noise maker like a whistle is also required. Randy recommends a pea-less whistle to make sure it works when you need it. Now that you are rigged and ready, where do you go fishing. You can catch any kind of fish in Georgia so take your pick. From small ponds to creeks and rivers, and even big reservoirs, kayaks give you access to all kinds of fish. Randy recommends three books to help you find where to fish. “Fishing Georgia” by Kevin Dallmier lists fresh and saltwater fishing spots. “A Canoeing and Kayaking Guide To Georgia” by Suzanne Welander, Bob Sehlinger, & Don Otey gives access points to waters with lengths of trips, a very important factor. And Randy says a good road atlas is invaluable to getting where you want to go. When planning a trip on a river or stream Randy says plan on fishing about one mile per hour. And he says you don’t want to fish more than about six hours a day or you will get very tired. You should always kayak in groups of at least two and that makes planning a trip much easier. Leave a vehicle at your take-out spot then drive upstream to put in. Floating downstream fishing is the way to go on moving water. Some of Randy’s favorite trips are the Ocmulgee River blow Jackson Lake dam, the Chattahoochee River south of Atlanta and the Ogeechee River. All are good bass fishing waters and have several access points. Randy says you want to stay in the Piedmont section of Georgia and south since shallow water and rapids make fishing further north difficult. Randy will be happy to get you into a kayak and take you fishing. The Georgia Kayak Fishing Club has many events where you can try kayaks and see how you like it. You can also experiment with different boats and rigging to see what suits you best. Check out kayak fishing. It is a fun, inexpensive way to get on the water and catch fish. The Georgia Kayak Fishing Club website is http://www.georgiakayakfishing.com/ – their link page – http://www.georgiakayakfishing.com/Links gives links to kayak clubs, kayak companies, outfitters, gear makers, destinations and other information for kayakers. This entry was posted in boats and boating, How To on June 29, 2015 by ronniegarrison. How Can Red Snapper Management Be Improved? I recently read an editorial that suggested recreational anglers should look to the North American Wildlife Conservation Model (North American Model) for answers to the red snapper management debacle in the Gulf of Mexico. While I’m grateful to see this highly successful and epochal model referenced in this unfortunately contentious debate over one of the South’s most iconic saltwater fish species, it became clear that the author, and probably most Americans, are not familiar with the “model” he referenced. Ironically, suggesting recreational anglers look to this model is perhaps the best argument yet for state-based management of our nation’s red snapper fishery, as well as all of our important marine recreational fisheries. States, in cooperation and with the support of recreational anglers and the sport fishing industry, have used this model to successfully manage our nation’s inland fish and wildlife resources for the benefit of all American’s for the last century. The whole concept of the North American Model is built on the premise that all fish and wildlife are held in public trust and belong to the people – not designated individuals for personal gain. That is actually the first tenant in the North American Model, which has seven principal tenants in all. Although ending commercial fishing would do more for the sustainability of our marine fisheries resources than the Magnuson-Stevens Act has ever done, the majority of recreational anglers are not advocating for the elimination of commercial fishing, despite many in that industry attempting to muddy the water with claims to the contrary. We simply want a system of management that provides appropriate access to the resource. Finally, in the same article, habitat restoration was also advised as something recreational anglers should pursue for the long-term sustainability of marine fish stocks. Fortunately, recreational anglers stepped up to carry that burden long ago, not the commercial fishermen or the environmental community. In addition to the license we buy just to go fishing, every time we purchase a package of hooks, a fishing rod, reel, lure, tackle box, depth finder, trolling motor, fuel for our fishing boat, etc., we gladly pay an excise tax that goes into a fund called the Sport Fishing and Boating Trust Fund. The majority of those funds go back to the states for fisheries conservation, angling and boating access and boating safety. However, 18.5% of that fund is dedicated to a program called the Coastal Wetlands Program. In 2015 alone, that 18.5% equates to around $112 million going to on the ground projects to conserve and restore coastal habitats. It’s part of the American System of Conservation Funding – paid for solely by anglers and boaters – and it’s the lifeblood of the North American Model. Recreational anglers have indeed looked to the North American Model for answers. We helped develop it, we vigorously defend it and we gladly fund it – not just for today, but for generations of American’s to come. It is not recreational anglers who need to look to the North American Model for direction, but our federal fisheries managers. This entry was posted in Conservation, Saltwater Fishing on June 28, 2015 by ronniegarrison. How Are Trout Doing In the US? WASHINGTON — America’s native trout have declined dramatically over the last century thanks to a number of threats ranging from hatchery fish stocking to logging and mining to poorly designed roads and livestock grazing practices. Now a new suite of threats, from energy development to a changing climate, poses even greater challenges. According to a new Trout Unlimited report titled, “State of the Trout,” these threats are greater than ever, and they make for an uncertain future for coldwater fish if steps are not taken to protect and restore habitat, reconnect tributaries to mainstem rivers and keep native trout populations viable for the benefit of anglers and the country’s riparian ecosystems. The report notes that, of the nation’s 28 unique species and subspecies of trout and char, three are already extinct. Of the remaining 25 species, 13 occupy less than 25 percent of their native ranges. Trout across America are dealing with the cumulative effects of resource extraction, climate change and the introduction and persistence of non-native fish into native trout waters. But, according to the report, there is hope for trout and for those who fish for them all across the nation. The report lays out a roadmap for native trout recovery and persistence, but it will require a host of advocates playing vital protection and restoration roles for years to come. “It’s daunting when you consider the scope of the threats facing coldwater fish in the United States,” said Chris Wood, TU’s president and CEO. “But if you step back and look at the work that TU and our partners are already doing all across the country, it’s encouraging to see progress and to know that, with help from volunteers, private industry, government agencies and elected officials, we can replicate that progress and keep trout in our waters. Like Wood, report author Jack Williams, TU’s senior scientist, believes all Americans have a stake in this report, and that it will require a collective effort to ensure a future for native trout in America. Williams notes that common-sense conservation measures in the years to come can help native trout recover. But, restoration needs to take place across entire watersheds and be sustained over decades. For instance, in Maggie Creek in northwest Nevada, collaborative restoration has been underway since the late 1980s. TU’s work with ranchers, the Bureau of Land Management and mining companies have restored 2,000 acres of riparian habitat and today native Lahontan cutthroat trout have been completely restored in 23 miles of Maggie Creek and its tributaries. In Maine, where TU and its partners helped negotiate the removal of two dams and construction of fish passage on a third, more than 1,000 miles of the Penobscot River has been reopened to Atlantic salmon, striped bass, herring and shad. In the West, in states like Idaho and Colorado, sportsmen and women have mobilized and helped protect millions of acres of intact, functional habitat that is vital to trout and the waters in which they swim. Broad-scale restoration work on streams in the Driftless Area of the Midwest has translated into waters that once held only 200 fish per mile to holding 2,000 fish per mile. TU’s public and private partners are key to the report’s findings. Without help from government, private entities and volunteers, trout truly do face an uncertain future. Like Ashe, Neil Kornze, director of the U.S. Bureau of Land Management, believes in partnerships to ensure trout survive for coming generations to enjoy. U.S. Forest Service Chief Tom Tidwell also noted that partnerships are vital to the long-term persistence of native trout in America. The report, according to Doug Austen, executive director of the American Fisheries Society, offers a glimpse at just how important trout are to America’s waters. “Today’s report paints a troubling picture of the status of trout, but it also features the hope that the more than 9,000 members of AFS share: effective partnerships with scientists, government agencies, fisheries managers, conservation groups and landowners can achieve amazing recovery results for these imperiled fish,” Austen said. And trout aren’t just a biological asset, either. Ben Bulis, the president and CEO of the American Fly Fishing Trade Association, notes that trout are vital to the industry his association represents. In the end, Wood said, it’s really about hope and optimism. Read the report today at tu.org/stateofthetrout. This entry was posted in Conservation, Trout and Salmon on June 26, 2015 by ronniegarrison. Why Join A Bass Club? I never met a fish I didn’t want to catch, but bass hold a special place in my heart. I vividly remember the day over 50 years ago when I caught my first one. Dad dropped grandmother and me off at the creek running out of Usury’s pond in McDuffie County. We walked up to the pool of water below the dam and started fishing. We had caught several small bream on our cane poles when my cork disappeared. I raised the pole but the fish didn’t dig down and make tight little circles like a bream, it jumped! That little 11-inch bass came out of the water three times and was the most exciting fish I had ever caught. My fate was sealed. Catching bass would become a life-long passion. Bass club fishing is a lot of fun. I have been in the Spalding County Sportsman club since 1974 and the Flint River Bass Club since 1978. Club fishermen compete at a little more relaxed level than in the money tournaments. The goal of each club fisherman in Georgia is to make the Top Six tournament each year. Georgia clubs have the option of affiliating with either The Bass Chapter Federation, an FLW organization, or the Bass Federation Nation, a BASS organization. Each group has a Top Six tournament each year where the clubs send a six man team to fish against other clubs for a little money, bragging rights and a chance to go on to the next level. For Federation Nation anglers the ultimate goal is to fish the Bassmasters Classic. Five federation anglers make it each year, one from each area of the country. At the Georgia Federation Nation Top Six at Seminole in early February the top 12 fishermen earned the right to go on to the Southern Regional at Santee Cooper, competing against 12 man teams from six other southern states. At the Regional the top man on each state team then advances to the Federation Nationals. There, the top man on each regional team will get a chance to fish the Bassmasters Classic. The FLW Bass Chapter Federation has a similar structure, with the top 12 from the state tournament advancing to a regional tournament. At the regional tournament the top angler from each state will get to fish the Walmart BFL All-American as a boater and the second place angler will get to fish as a non-boater. The top angler from each state will also advance to the FLW National Championship. The top two anglers there will get an entry into the Forrest Wood Cup as a boater and no boater. The winner at the national championship will also get a “Living the Dream” package including paid entry to FLW Tour for a year and a wrapped boat and truck to use during the tournament season. Georgia bass fishermen have amazing possibilities if they like tournament fishing. Consider joining a local club and start on your road to fame and success if you want to try tournament fishing. This entry was posted in Bass Fishing, Tournament Fishing on June 25, 2015 by ronniegarrison. What Are Ten Tricks For Walleye? Every walleye angler worth his or her salt has one. You know, that sneaky trick up the sleeve that always gets rods thumping with action. Cold fronts, Jet Ski conventions, breathless summer days, or August blizzards (it could happen); the conditions are almost beside the point. You want a plan of action that works for walleyes, especially when the going gets tough and you’re fresh out of fish-catching ideas. Consider . . .
Big frisky minnows like creek chubs or golden shiners appeal to walleyes on basic, animalistic levels. It’s why anglers often rig an extra rod or two for minnow duty, placing them in rod holders while they cast with more active presentations. A long, soft spinning combo, such as a 7’6″ St. Croix Legend Tournament Walleye rod, outfitted with a slip-sinker rig allows the minnow to struggle freely, while a #1 circle hook safely self-hooks fish, even if you’re not paying attention. Always exciting to suddenly realize one of your rods is folded over and pounding under the weight of a big ‘eye. Particularly in stocked walleye waters, submerged vegetation provides these white-tailed predators with prime habitat: cover, oxygen and a ready-made supply of food. When it comes to walleye weeds, variety matters. Preferred plant species include large leaf pondweed (cabbage), elodea, chara, and coontail, with patchy, intermingled forests usually providing the most favorable environs. Crankbaits and jigs can score within deep or sparse vegetation, while 3/8- to ¾-ounce jigs dressed with specialized soft plastics, such as BFishn Tackle’s 4-inch Moxi and Paddle Tail yield wonderful results, often throughout the summer. Cast and simply do a nice steady retrieve, and hang on for arm-wrenching strikes. High tech has become a big part of the walleye game, and one of the neatest new developments allows angling adventurers to create their own custom contour maps on previously uncharted water. 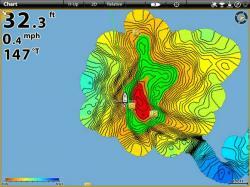 Imagine the advantages of possessing the only depth map in existence of your local river or favorite backwoods lake? Discovering that sweet little sunken island no one knew existed? Humminbird offers Auto Chart Live, specialized mapping software that couples GPS waypoints with corresponding depth to instantly build never-before-seen contours on your chosen waterbody. Lowrance also offers Insight Genesis, a DIY map program requiring computer processing in addition to on-water reconnaissance. Previously deployed primarily by ice anglers, heavy jigging-style lures such as the Jigging Rapala and Custom Jigs & Spins’ RPM Minnow (new for fall 2016) have become new classic walleye lures, especially in open water. The anvil-like weight of these compact baitfish imitators allows them to be cast or jigged in deeper water, giving the angler complete contact and control. A simple snap, drop, pause presentation makes the lure dart, glide and stop on a dime—moves that have lately scored boatloads of big ‘eyes all season long, winter notwithstanding. Walleyes like structure, right? Not always. With apologies to Buck Perry, the truth is, walleyes go where the food goes. In many lakes and reservoirs, that means featureless open water. From late spring through summer, some of the biggest walleyes in many waters (not just the Great Lakes) suspend 10 to 25 feet down over much deeper water. Sonar and surface-feeding birds help unearth schools of pelagic bait—ciscoes, shad, smelt, alewives, and shiners. Baitfish clouds also point to the presence of predators. Trolling baitfish imitating cranks or casting with spoons can each produce a surprising quantity of outsize ‘eyes. One of the most overlooked fish-finding factors is oxygen and an aquatic phenomenon known as the thermocline. This thin layer of water can be a walleye-holding goldmine. The thermocline is the region offering a precipitous change in dissolved oxygen levels. Below the thermocline, oxygen may be too scarce to sustain fish life. 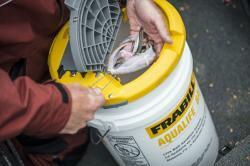 But above is an ample supply for healthy fish activity. Easiest way to find the ‘cline is to drop an underwater camera armed with a depth and temperature probe, such as the Aqua-Vu 760cz. When the temp starts dropping fast—often going from the 70s to upper 50s within several feet— you’ve hit it. You can also ID the ‘cline with a well-tuned sonar, which may display the thermocline as a continuously line of “clutter.” Focus on or just above these depths, especially along structural intersections, and you’re likely to put on a walleye-catching clinic. Another delightfully overlooked option, small rivers can offer ideal walleye habitat that often see scant few hooks all summer. Constant current means walleyes are always actively feeding somewhere. And a fishing kayak, such as Old Town Predator XL, can be the perfect way to float a sizeable stretch, surveying some alluring flora and fauna and sampling some potentially amazing fishing. Grab a medium-action spinning rod and a small box of tackle; small minnowbaits and ¼- and 3/8-ounce jigheads alongside packs of your favorite softbait. Among masses of super twisters and a profusion of paddletails, BFishn’s 4-inch Ringworm has become a go-to option among seasoned river rats. Swim lures through shallow riffles above deep holes, or jig behind any type of current break—from downed logs to boulders to inside bends of small points. small lures and fish below the boat. For vertical jigging suspended walleyes or fish in tight clusters in deep water, this sort of interactive fishing can become addictively fun, and is often an effective way to gauge fish activity and response to different lures. Folks tend to write bobber fishing off as simplistic, juvenile, and only effective for sunfish. Actually, a slip float rigged above a lively ribbon leech is among the deadliest of all walleye presentations. And it is simple, which is the other part of its charm. With the addition of a stop knot, you can deliver bait to any depth, or keep it hovering enticingly above snaggy rock or vegetation. In wind, slip-bobber fishing while anchored near a rocky point can yield remarkable results. And at night, a lighted cork has been known to produce many a walleye monster. Some days, the walleyes just don’t want to bite. Other times, they seem as scarce as Sasquatch. No problem. There’s always something biting. Why not carp? Blimp-size carp thrive in many top walleye waters, as do channel catfish and bowfin—two more freshwater rogues with lots to love. These unconventional sportfish like to bite, pull like freight trains and can be caught with simple rigs and tackle; often the same stuff you use for walleyes. Many times, the opportunity for pure fishing fun is but a cast away—swimming right before your eyeballs. This entry was posted in How To Fish, Walleye and Sauger on June 24, 2015 by ronniegarrison. My father grew up on a dirt poor farm in Jacksonville, Georgia near Lumber City and McCray. He and his two brothers and five sisters worked hard even as kids to survive. I never knew his father, he died before I was born, but his mother lived in Ocala, Florida with one of her daughters and I saw her a few times a year. Daddy joined the Navy as World War II started when he was not yet 20 years old. He never talked much about his service, other than he trained to be a gunner and got deathly seasick on the troop transport to the South Pacific. He said he threw up for 30 days straight! After getting a medical discharge for rheumatic fever he came home and lived with one of his sisters in McDuffie County where he met my mother. Like many of his fellow veterans, he went to college on the GI Bill and graduated with a degree in agriculture from the University of Georgia. After college they moved back to McDuffie County and I was born that summer. I was born in Athens since mama continued to go to her doctor there after they moved away in June of 1950. Daddy was the agriculture teacher and shop teacher at Dearing High School. Part of that job was visiting local farmers and helping them out with everything from soil testing to hog castration. When schools consolidated around 1960 and the high school students were sent to Thomson, he became principal of Dearing Elementary and stayed there until retiring in 1977. In the seventh and eighth grade he taught me math and shop. It was a small school so the principal also taught some classes each day. When I say small I mean small. I started first grade and went through eighth grade with the same 28 students, all in one classroom each year as we moved from grade to grade. Daddy also bought a small farm and started an egg producing operation, starting small with four houses with about 1200 chickens each. When I was a teenager he added four more houses, much more modern and housing about 1500 layers each. Our 11,000 chickens provided eggs for most of the grocery stores in the area from the A&P and Winn Dixie to mom and pop country stores. And dozens of people came to our house to buy eggs in small amounts. Daddy loved bird hunting and kept two pointers in some old chicken houses about a mile from our house. We fed them every day and could not wait until quail season opened each year. I spent many hours with him, following the dogs and hoping to find a covey of birds. For several years I just walked along and learned safety and hunting etiquette. Then I was allowed to carry a .410 shotgun and actually try to hit a bird when the covey or a single flushed. I don’t think I ever did, although I was deadly with the shotgun on squirrels and anything else sitting still. Since daddy knew many farmers well we were also invited to dove shoots every Saturday during season. I was daddy’s retriever for several years and prided myself on finding every bird he hit no matter where it fell. And again I was learning about dove shooting and safety while sitting in the blind with him. I was really proud when I was allowed to take my .410 with me and had all my equipment in an old gas mask bag one of my uncles gave me. I still have that bag, more than 50 years later, and use it while deer hunting now. And a few times I actually hit a dove on those shoots and got to put it in my bag! I can remember only one time daddy went squirrel hunting with me. I went many afternoons after school and even some mornings before school. One afternoon daddy went with me. I killed my limit of ten that afternoon, one of my best hunts, and daddy never killed one. But he never shot at one either, letting me kill all we saw. He was much more proud of me killing them! Daddy didn’t like fishing very much and never went with me or mama. Mama loved fishing and went every chance she got. As he got older daddy did start crappie fishing with us in the spring at Clarks Hill. Not because he liked fishing but because he loved to cook and eat crappie. I was expected to work on the farm from an early age. And daddy depended on me and my brother helping out. But I know he did extra work many times so I could go hunting or fishing rather than work. Happy Father’s Day. If you can, enjoy some time with your father. If he is gone, like mine, rejoice in his memory. And if you have kids, spend some fun time with them. They will always remember fishing or hunting trips long after movies and games they like are long forgotten. This entry was posted in Fishing Ramblings - My Fishing Blog, Fishing With Family and Friends on June 23, 2015 by ronniegarrison. How Can I Protect Myself from the Sun While Fishing? I have spent my lifetime in the sun fishing. That is over 55 years of almost constant exposure. In my younger days I would often fish without a shirt, never wore sunscreen and didn’t like sunglasses. But as I got older I realized the danger and started putting sunscreen on before going fishing. I like a baby sunscreen of 50 to 100 rating. It is supposed to be “tear free” and not burn your eyes, but after sweating all day it always seems to get into my eyes and burn. 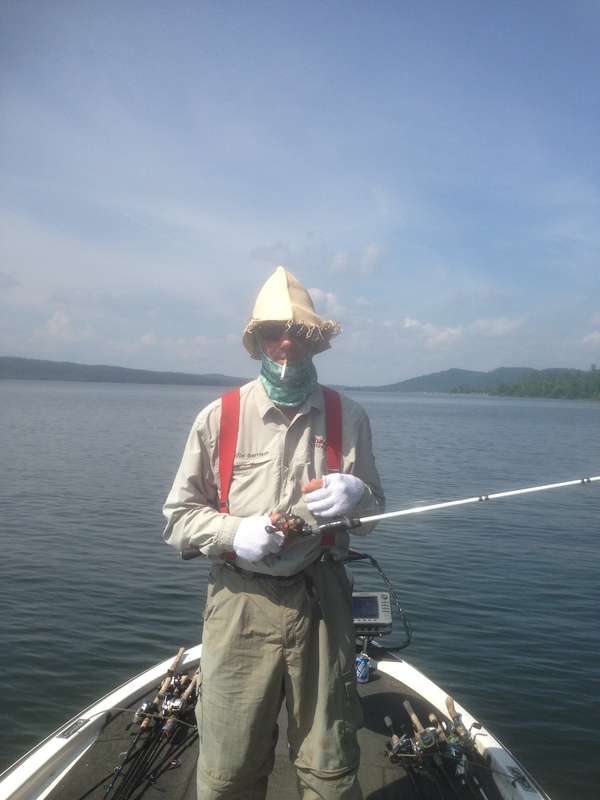 In early June I fished four days in a row at Guntersville. Every day was bright and sunny , and very hot with little breeze. To make things worse I was three weeks into a 30 day round of Tetracycline – an antibiotic that makes your skin very sensitive to the sun. I knew I had to block all the sun. At the Bassmasters Classic in Birmingham two years ago I was given something in my media pack from Dicks Sporting Goods that I had no idea what it was. It was a tube of light cloth of some kind with Dicks logo on it. my wife had seen them and told me it was a sun mask that you could wear around y our neck and pull up over your nose, cheeks chin and ears. She even showed me a couple of different ways to wear it. Now I see lots of people wearing them but they looked hot. But at Guntersville I had to try it. And it was surprisingly cool and comfortable. I wore long nylon pants, sox, long sleeve shirt and even bought some cheap cotton gloves and cut the thumbs and first finger out so I could fish while wearing them. After the second day of fishing my two thumbs and fingers that were exposed were burning. By the fourth day they hurt even though I kept spraying thick white 100 rating sun screen cream on them all day. 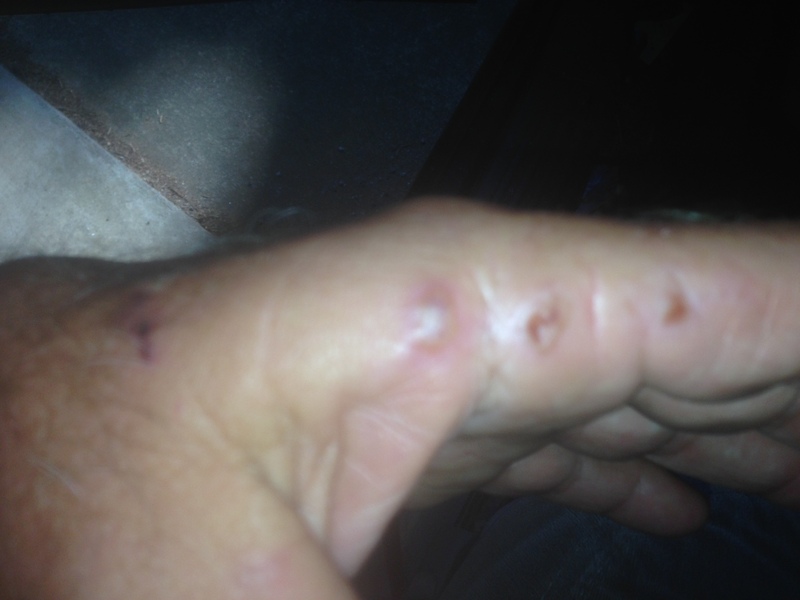 A few days after I got home the blisters shown below were on my left hand that was exposed while holding my rod. My right hand, the one turning the reel handle, had a couple of smaller ones. I guess if I had not worn everything I had on my whole body would have been one big blister! Bottom line – protect yourself from the sun while fishing! This entry was posted in Fishing Ramblings - My Fishing Blog on June 21, 2015 by ronniegarrison. What Is A Florida Strain Largemouth Bass? 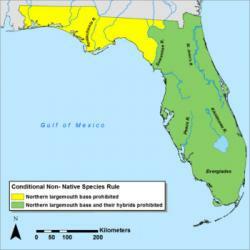 Map of Florida showing the prohibition line for northern largemouth bass and their hybrids. Florida bass, Micropterus floridanus, have a small natural range; they are only native to peninsular Florida. This species grows larger than any other black bass, which is a big part of the reason they are the premier freshwater sport fish in Florida. Recognizing the ecological and economic value of genetically-pure Florida bass, FWRI biologists conduct research to help prevent these bass from mating and producing hybrid offspring with non-native northern largemouth bass,M. salmoides. The taxonomy of these two bass sparked a debate amongst scientists for more than a decade. The Florida bass and the northern largemouth bass look very similar, but do they represent different species or subspecies? They were originally described as subspecies of largemouth bass in 1949 and the American Fisheries Society (AFS) has continued to use this terminology – until recently. Many scientists have become convinced that the Florida bass is a distinct species based on genetic, behavioral, and environmental preference/tolerance differences. During a statewide genetics study, scientists analyzed bass collected from 48 lakes and rivers throughout Florida. The sampled water bodies included populations of pure Florida bass and intergrade (or crossbred) populations where Florida and northern largemouth bass mixed or hybridized. Populations of pure Florida bass were found south of the Suwannee River, while intergrade populations were located in northern and western parts of the state. This led the FWC to amend a rule to designate pure northern largemouth bass as a conditional species (dangerous to native ecosystems) south and east of the Suwannee River. This was intended to prevent this non-native species from being moved into the range of pure Florida bass in peninsular Florida by anglers, private pond owners, or fish dealers. The FWC is dedicated to preserving the long-term well-being of fish and wildlife resources. To that end, the agency designated four geographic regions of the state as Florida bassGenetic Management Unitsafter research indicated that bass in each area had unique genetic compositions. When FWC is stocking hatchery bass or relocating wild-caught bass, fisheries managers avoid transporting bass betweenGenetic Management Unitsto avoid mixing gene pools. FWC takes this precautionary approach when moving bass because research has shown that fish have adaptations that help them survive and reproduce in the environments in which they naturally occur. Biologists collect tissue samples from fish in the wild and at the hatchery and send them to the FWRI fisheries genetics laboratory for analysis. Geneticists at FWRI developed a set of molecular markers that are able to effectively identify each species of black bass and detect individuals that have hybrid ancestries. The geneticists work with the Richloam Fish Hatchery staff at the Florida Bass Conservation Center to conduct genetic testing that makes sure that only pure Florida bass are allowed to spawn at the hatchery. This ensures that only pure Florida bass are released into water bodies during stockings. Geneticists are also able to determine whether a bass collected by a biologist in the wild was produced at the hatchery. Resource managers can use this information to determine the survival rate and contribution of hatchery fish after stocking. Since its creation, the bass genetics project has expanded to include research on all the black bass species that are native to Florida, including Suwannee bass, shoal bass, and the newly classified Choctaw bass. These studies will provide resource managers with information they can use to protect the genetic integrity of native species by preventing or minimizing the chance of hybridization with invasive species. This program was designated as a high priority by fishery managers in FWC’s Florida Black Bass Management Plan. Fisheries agencies in other states also promote black bass conservation, but FWC’s Florida Bass Conservation Program is by far the most comprehensive genetic conservation and management program for black bass in the country. This entry was posted in Bass Fishing, Conservation on June 20, 2015 by ronniegarrison. How Are Rainbow Trout Doing In Colorado? DENVER, Colo. – After being devastated by whirling disease in the 1990s, rainbow trout populations are increasing in most major rivers in the state thanks to a 20-year effort by Colorado Parks and Wildlife aquatic scientists and biologists. “It’s been a long road, but bringing back populations of fish that were essentially extirpated from Colorado can only be called a huge success,” said George Schisler, CPW’s aquatic research team leader who is based in Fort Collins. The comeback is positive news for anglers who can once again fish for rainbows and brown trout in Colorado’s big rivers and streams. For the past 15 years brown trout have dominated most of the state’s rivers. But since last summer, anglers have reported that they are catching nice size rainbows in the upper Colorado, Rio Grande, upper Gunnison, Poudre, East, Taylor, Arkansas and Yampa rivers and others. The whirling disease problem started in 1986 when a private hatchery unknowingly imported infected rainbow trout from Idaho that were stocked in 40 different waters in Colorado. The disease eventually spread throughout the state and even infected CPW hatcheries which caused more waters to be infected. Whirling disease is caused by a spore that infects the spine of very young fish. The infection deforms the spine causing the fish to swim in a whirling pattern. They die shortly after becoming infected. When whirling disease hit Colorado’s rivers, natural reproduction of the species virtually ended. That allowed brown trout, which are not affected by the disease, to become the dominant sport fish. By the mid 1990s rivers in Colorado and other western states were thoroughly infected. At a national conference on whirling disease in Denver in 2002, a German researcher presented information that showed trout at a hatchery in Germany, operated by a family named Hofer, were resistant to the parasite. Colorado’s aquatic staff moved quickly to import eggs from Germany which were hatched at the University of California at Davis. The fingerlings were then brought to CPW’s Bellvue hatchery near Fort Collins. The fish grew quickly and their disease resistance was proven. By 2006 Schisler stocked some of the Hofers in two reservoirs west of Berthoud. Anglers reported that the fish hit hooks hard and were easy to catch. This made them ideal for stocking in reservoirs where anglers expect to catch fish. But because the “Hofers” had been domesticated in a hatchery for generations, Schisler and his colleagues knew that the fish did not possess a “flight response” to danger. They would have little chance in creeks and rivers where they need to avoid predators and survive fluctuating water conditions. So CPW researchers started the meticulous process of cross-breeding the Hofers with existing strains of trout that possessed wild characteristics and had been stocked in rivers for years. After three years some of the crosses were ready for stocking in rivers –- with the hope that the fish would survive, reproduce and revive a wild, self-sustaining population of rainbows. Biologists first stocked 5-inch Hofer-crosses, but they didn’t survive. Then in 2010, fingerlings were stocked in the Colorado River near Hot Sulphur Springs. When researchers returned to survey the area 14 months later they learned the experiment had finally paid off. 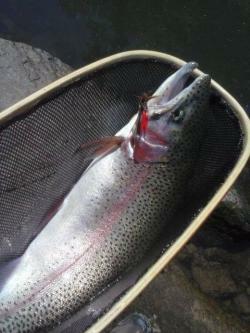 They found good numbers of 15-inch rainbows and evidence that young fish were hatching in the wild. CPW biologists have been stocking fingerling Hofer-crosses throughout the state at different sizes and times of year to optimize survival. The young fish are surviving and Schisler is confident that Colorado’s rivers and streams are again home to truly wild rainbows. fish grow much faster than standard rainbow strains, state hatcheries can raise more fish in a shorter amount of time. They can also be crossed with CPW’s various trout strains and are well suited to reservoir where they don’t reproduce naturally but are ideal for still-water anglers. In the late 1990s many CPW scientists worried that truly wild rainbow trout would disappear. Now a new chapter for sport fishing in Colorado is just getting started … again. This entry was posted in Conservation, Trout and Salmon on June 18, 2015 by ronniegarrison. Say “Lake Guntersvile” to any bass fisherman and they instantly think of catching lots of big bass. 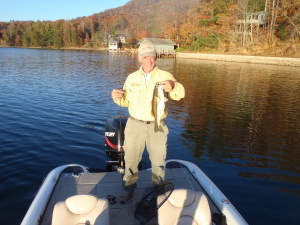 Guntersville is one of the best, if not the very best, bass lake in the US. Big tournaments there produce big catches. Five fish limits weighing over 25 pounds are common. But there is another side to Guntersville. The minimum size limit on largemouth and smallmouth bass is 15 inches, a size not common in our club tournaments. So that makes it harder to catch a keeper. And the lake is very crowded. It is not unusual to find six to ten boats within casting distance of each other on a ledge when a school of bass is located. And if you happen to catch a fish while alone in a spot you won’t be alone long! Fishermen hear about the great catches but they seldom hear about what the average club fisherman does. In the club creel census reports for Guntersville, it is the hardest lake in Alabama to catch a keeper in a club tournament and the lake with the fewest keepers per hour of fishing in the whole state. But there is a chance of catching a personal record stringer there. That is why it is so crowded, and why the Flint River Bass Club set our June tournament there. Like other tournaments, we had a few good catches and some not so good ones. Guntersville is about four hours from Griffin and we had only seven club members make the trip for our two day tournament last weekend. After fishing ten hours on Saturday and eight more on Sunday, we brought in 42 keepers weighing about 93 pounds. There were six five-fish limits and no zeros. 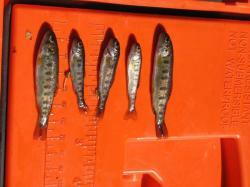 We did have six spotted bass brought to the scales and they only have to be 12 inches long. I managed to win with eight keepers weighing 23.13 pounds, Gary Hattaway had ten weighing 21.14 for second and big fish with a 5.12 pound largemouth, my partner Jordan McDonald had ten weighing 20.71 for third and Niles Murray had eight at 19.46 for fourth. Before going to a lake I don’t know I often get information from fishermen I have done articles with. I was excited when Brad Vice, a college fisherman that I had worked with in February on Guntersville, told me had had weighed in five bass weighing 28 pounds in a tournament the week before. And he sent me two GPS coordinates for the places he caught them. Jordan and I went over Wednesday afternoon, set up camp then got up early Thursday and Friday to practice. On one of the places Brad sent me I caught a four pounder and my depthfinder showed many more fish in the area. Fortunately, Jordan had gotten some information too. We went to some of his places those two days and caught some fish on them, and on some other places we found on our own. Saturday morning we went to a big grass bed Jordan had been told about, and in the first two hours of fishing he caught five keepers and I got two. For some reason I kept missing fish. Then, about 10:00, we went to some docks he had been told about and where I had caught three keepers off the first five docks the day before. In the next two hours I caught five fish off those docks, including three off one of them. Those five dock fish weighed 17.05 pounds and gave me the lead and big fish of 4.55 for the first day, one of my best catches ever. On Sunday we went back to the grass and Jordan got four to my one. We then fished docks and I got two more and so did Jordan. Although we fished hard we could not catch any more fish, and the spot Brad sent me we never got a fish. There were at least five boats fishing it every time we tried it during the tournament. Niles had the same kind of luck I had. His limit on Saturday weighed 13.45 pounds for second place but he caught only three the second day. Gary had limits both days to come from behind for second place. 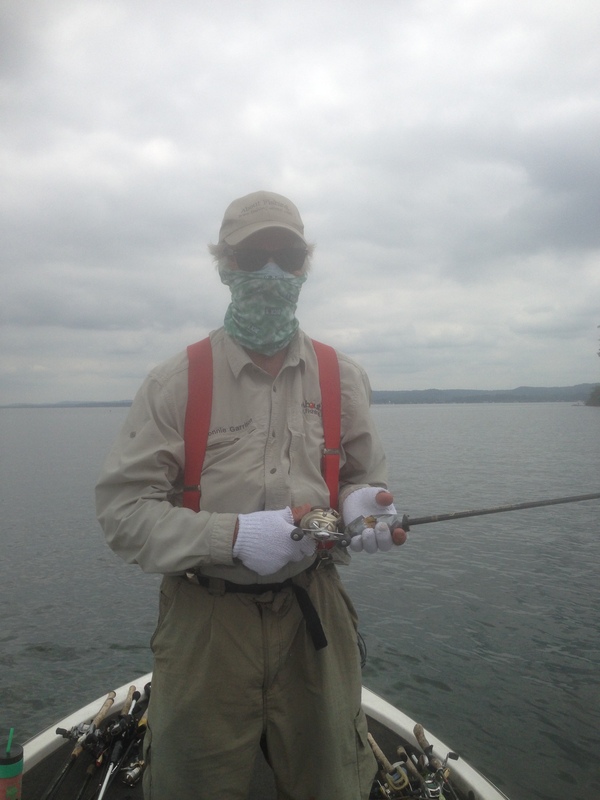 Guntersville is a beautiful lake and it does have good fish in it. If you work at it you can catch some nice stringers. But in our tournament, two of the fishermen weighed in only three keepers in two days between them. This entry was posted in Bass Fishing, Tournament Fishing on June 17, 2015 by ronniegarrison.